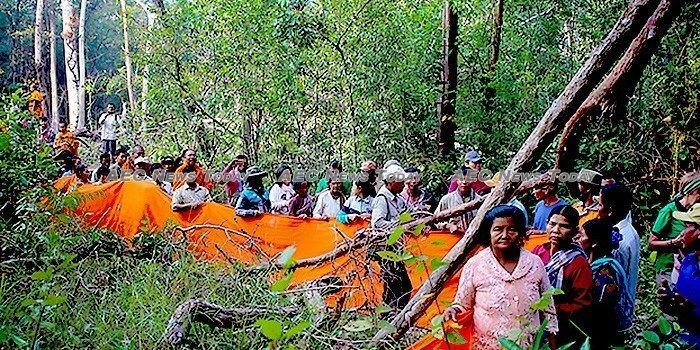 Those taking part in the two-day long ceremony hope that the cloth, blessed by the monks, will protect the trees from illegal loggers who are decimating Cambodia’s forests. A short video clip showed the monks and supporters carrying Cambodia flags and chanting prayers as they traipsed their way through the wild undergrowth, wrapping pieces of the blessed cloth around the trunks of trees. A recent report by the Prey Lang Community Network (PLCN) found that deforestation in Prey Lang forest is threatening the local economy, food security and biodiversity, and has the potential to worsen climate change. According to the report the high rate of deforestation is primarily the result of new government regulations requiring environmentalists and those who wish to patrol the forests looking for illegal activity now requiring a permit before doing so. Illegal loggers, they say, are being tipped off by some corrupt local officials making the patrols ineffective. Satellite imagery shows that Cambodia’s forests reduced at the rate equivalent to 21 football fields in size every day in 2017, with some 5,600 hectares (about 13,838 acres) vanishing. Smugglers transport illegally harvested lumber to neighbouring counties, particularly China and Vietnam, where the often rare timber is crafted into expensive furniture. Last September in a report titled Vietnam in Violation: Action required on fake CITES permits for rosewood trade, the London-based Environmental Investigation Agency (EIA) accused the Vietnam government of direct complicity in the smuggling of Siamese rosewood (D. cochinchinensis). The report said that despite Cambodia advising Vietnam in 2013 that no permits for Siamese rosewood were being issued, between 2013 and 2014 Vietnam authorised the import of over 8,000sq.m of the endangered species. In May last year the EIA claimed that between November 2016 and March 2017 some 300,000 cubic meters (10.594 mln cubic feet) of timber –including endangered rosewood– had been smuggled out of protected areas in Cambodia to Vietnam, some $13 million in bribes allegedly easing the way. Cambodia’s Ministry of Agriculture, Forestry and Fisheries (MAFF) said it prosecuted 1,093 cases of forestry crimes in 2018, down on the 1,438 prosecuted in 2017. According to the NASA Earth Observatory website Cambodia lost some 1.44 million hectares (5,560 sq. miles) of forest between 2001 and 2014 with annual forest loss put at 14.4 per cent — one of the world’s fastest rates of deforestation. Meanwhile in January Myanmar authorities seized 63 tons of illegally harvested timbers from a forest reserve in southern Bago region. 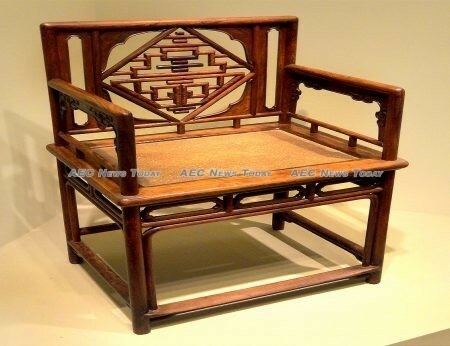 A two-yearlong investigation by the EIA large quantities of Myanmar’s rare teakwood are being smuggled illegally into neighboring China due to “systematic corruption” by senior officials. A UN Food and Agriculture Organization (FAO) report says that between 2010 and 2015 Myanmar lost an average of more than 546,000 hectares (1.3 mln acres) of forest each year.